The Taiwanese award-winning aluminum computer chassis maker Lian-Li has added two new additions to its Q series of computer chassis – the PC-Q12 and the PC-Q18. The addition of the new chassis adds even more style to Lian-Li’s product list and offers users an even better choice in the quest for elegant-looking space-saving cases with high data storage capabilities. The two new offerings have quite a few common things – first they both support mini-ITX boards and offer elegant brushed anodized aluminum frames, easy-to-remove snap-off panels, and USB 3.0 connectivity on the front panel. Both cases can also serve as a central data center for numerous electronic devices such as smartphones and tablets. Owners of the new PC-Q12 case can place it horizontally or vertically and the case packs a lot of storage capabilities – four 2.5-inch bays for a chassis with just 88 mm x 365 mm x 208 mm (W x H x D) dimensions. Due to its size, however the PC-Q12 chassis does not support external VGA cards or internal optical drives, although a slim optical drive can be added for all those customers who must read CD/DVD discs. The Lian-Li PC-Q12 also comes with a 300 W power supply with 80-Plus efficiency and a 80 mm fan that sits on top of the case and blows air right over the motherboard. 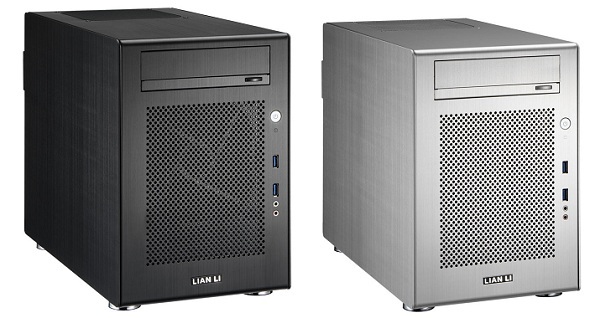 Available in black and silver the new Lian-Li product will be sold for 159 USD. The PC-Q18 is a slimmer upgrade to the PC-Q08 and comes with four hot swappable 3.5-inch hard drive bays and a bottom tray that can hold two 3.5-inch hard drives or three 2.5-inch HDDs/SSDs. Measuring 199 mm x 290 mm x 365 mm (W x H x D) the case offers support for all kinds of hardware. The existing 5.25-inch optical drive bay is complemented by support for VGA cards with a length of 340 mm and a CPU cooler up to 160 mm in height. Furthermore, current and future expandability is ensured thanks to the two expansion slots. Two 140 mm fans – one of which blows air directly on the HDD bays, while the other takes away unnecessary heat, provide cooling for the Lian-Li PC-Q18. Available in black and silver the PC-Q18 will cost 159 USD too.